You could say that Drew Moret has been around fishing his whole life. After all, he grew up surrounded by some of the finest anglers and guides in South Florida and cut his teeth in the sport fishing with his father Sandy and the likes of other noted anglers and guides like Chico Fernandez, Flip Pallot, Steve Huff, Tim Klein and Craig Brewer. Drew says “The part of being a guide I enjoy the most is helping anglers catch their first tarpon on fly. It is an experience they will remember forever and I relish the moment as much as the anglers.” He has guided hundreds of anglers to their first tarpon on fly. Drew has a very successful tournament resume, including winning the 2014 Islamorada SharkFly and finishing in the top 3 five times. He was guide to the Grand Champion in the 2009 Islamorada Backcountry Fly Championship, guide to most releases in the 2015 Golden Fly and has 3 top three finishes in the Golden Fly. What’s my perfect day at work? 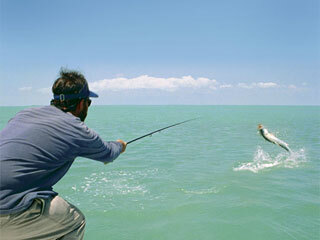 “Helping clients catch their first tarpon on fly. That’s something they’ll remember forever”.